Last Friday I went with some friends to watch a play, ‘Marching on together’ by Adam Hughes, at the Old Red Lion pub/ theatre. I bought the ticket mainly because I wanted to see my friend, so I hesitated when I found out the play was about – shock horror – football. 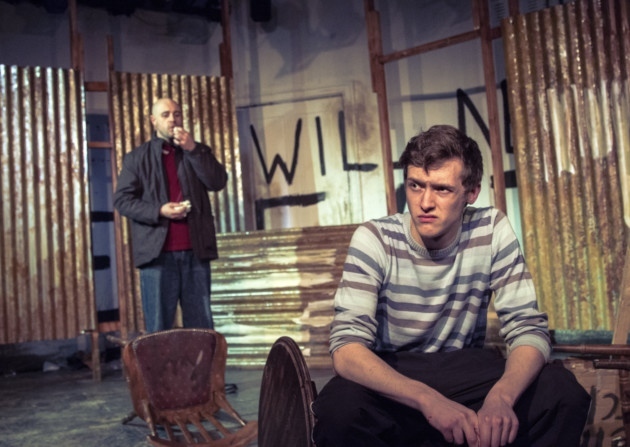 Football hooliganism in particular, which seems like the worst theme a play could be about for me – it conjures images of skinheads and beer and violence. And to be fair, I wasn’t wrong. The play is set in Leeds in 1984, and follows the story of Macca, ex-leader of the notorious Service Crew, as he is released from prison to find that his former friends (members of the Service Crew) have moved on and he is standing still, trying to fit in with the new football hooligans as life as he knew it crumbles before him. It is not all about football hooliganism – the miners’ strike is in full swing and Macca attempts and fails to reunite with Linda, his former girlfriend, and their young son. That said, it was much better than I anticipated and there were times in the play when I was genuinely moved. The plot was rather predictable in some respects and I wasn’t overly convinced by the ending which involved a set of coincidences, which seemed a bit too convenient in my opinion, and left the play teetering on the edge of sentimentality. However, the acting was very good. I think the intimacy of the venue, the realist dialogue and snappy scenes, broken up with amazing 80’s tracks, helped push the play forward and engage the audience. As a definite ignoramus when it comes to football hooliganism, I actually found that aspect fascinating from a social standpoint. ‘Marching on together’ helped me understand the motivation for young men (in most cases) to turn to football hooliganism – in most cases, it seemed to be a need to assert themselves, to belong and feel something other than the banality of their, often impoverished, lives. The play emphasised how addictive some people found the fight, and I felt that the play effectively depicted Macca’s mental distress and descent into depression with his simultaneous increasing desire to fight and pummel anyone who was not a Leeds supporter. Overall, it was enjoyable. It was a bit strange that after a play about football hooliganism, we found ourselves in a pub rammed with beer-swigging spectators, one screaming expletives in my ear, as there was a rugby game on. It was rather formulaic but still a great insight into a grim topic, and the acting more than made up for any of its flaws.